Located in the fantastic Gates Nurseries, Cold Overton, we have a wide selection of Tropical, Coldwater and Pond fish, along with all the associated dry goods. 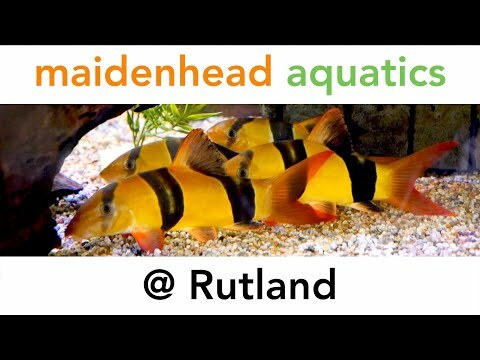 Maidenhead Aquatics at Rutland is a modern and thoughtfully arranged store. At the entrance you are greeted with the till area plus a large display tank. This is also the indoor dry goods section of the store, where you will find everything you need for your aquarium. Towards the rear of our store is filled with more tanks and cabinets, which are all assembled and on show, plus our extensive pond dry good section, where you'll locate everything you would need for your pond. The central area of the store houses the livestock, with tropical and coldwater fancy goldfish filling the stock tanks with every imaginable colour! With hundreds of system aquariums, we have plenty of livestock to offer! Our regular livestock consists of Rainbowfish, Barbs, Gouramis, Loaches, Danios, Tetras, Livebearers, South American Cichlids, Catfish, Anglefish, Corydoras, L- number plecs and Fancy Goldfish with a smaller selection of Discus, Rasboras, Malawi Cichlids, Oddballs and softwater fish. Outside you'll find our pond livestock section, which is fully stocked from spring to autumn with a good selection of pond fish (including koi) and plants. Here you will also find pond liner, waterfalls and a selection of pre-formed ponds. If you have any questions about this or anything aquatic then please don't hesitate to phone our friendly staff on 01664 454646. We very much look forward to seeing you in-store soon!